Wheat flour contains gluten which is the protein that strengthens and binds dough in baking. Because of this, when baking with wheat free flours you may need to source alternative binding agents. Wheat free recipes using flour substitutes usually have been carefully formulated to get the best possible result taking into account the problems associated with lack of wheat gluten, therefore substitution can be a risky experiment. If you try substitution, then be aware that you may get a failure, so don’t do it for the first time if cooking for an important occasion. 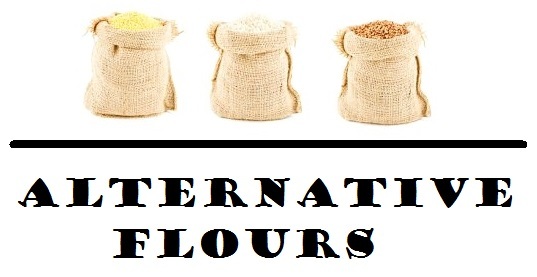 The flours listed below are alternatives to wheat flour. However it is important to be aware that there is no exact substitute for wheat flour, and recipes made with wheat free alternative flours will be different from those containing wheat. It’s always best to store flours in airtight containers, in a dark cool place to avoid them turning rancid. Brown rice flour is heavier than its relative, white rice flour. It is milled from unpolished brown rice so it has a higher nutritional value than white, and as it contains the bran of the brown rice it has a higher fibre content. This also means that it has a noticeable texture, a bit grainy. It does have a slight nutty taste, which will sometimes come out in recipes depending on the other ingredients, and the texture will also contribute to a heavier product than recipes made with white rice flour. It is not often used completely on its own because of its heavier nature. Bulk buying is not recommended as it is better used when fresh, store in an airtight container. Buckwheat flour is not, despite its name a form of wheat, buckwheat is actually related to rhubarb. The small seeds of the plant are ground to make flour. It has a strong nutty taste so is not generally used on its own in a recipe, as the taste of the finished product can be very overpowering, and a little bitter. Alternative names: beech wheat, kasha, saracen corn. Made from ground chia seeds. Highly nutritious, chia seeds have been labelled a “superfood” containing Omega 3, fibre, calcium and protein, all packed into tiny seeds. Also known as “nature’s rocketfuel” as many sportspeople and superathletes use it for enhanced energy levels during events. If chia flour isn’t readily available then put chia seeds in a processor and whizz up some. If used in baking, liquid levels and baking time may need to be increased slightly. This is ground from chick peas and has a strong slightly nutty taste. It is not generally used on its own. Cornflour is milled from corn into a fine, white powder, and is used for thickening recipes and sauces. It has a bland taste, and therefore is used in conjunction with other ingredients that will impart flavour to the recipe. It also works very well when mixed with other flours, for example when making fine batters for tempura. Some types of cornflour are milled from wheat but are labelled wheaten cornflour. Alternative name: cornstarch. Made from ground hemp seeds it has a mild, nutty flavour. Needs to be refrigerated after opening. Made from a legume in the same plant family as peanuts. High in protein and fibre, low in fat, but carries the same protein that causes allergic reactions/anaphylaxis to peanut or legumes, which makes it unsuitable for people with peanut or legume allergies e.g. soybeans. Comes from the grass family, and is used as a cereal in many African and Asian countries. It can be used to thicken soups and make flat breads and griddle cakes. Because it lacks any form of gluten it’s not suited to many types of baking. This is a fine white flour made from potatoes, and has a light potato flavour which is undetectable when used in recipes. It’s one of the few alternative flours that keeps very well provided it is stored in an airtight jar, and somewhere cool and dark. Ground from sorghum grain, which is similar to millet. The flour is used to make porridge or flat unleavened breads. It is an important staple in Africa and India. This flour stores well under normal temperatures. Soya flour is a high protein flour with a nutty taste. It is not generally used on it’s own in recipes, but when combined with other flours is very successful as an alternative flour. Can be used to thicken recipes or added as a flavour enhancer. It needs to be carefully stored as it is a high fat flour and can go rancid if not stored properly. A cool, dark environment is recommended and can even be stored in the refrigerator. Tapioca flour is made from the root of the cassava plant, once ground it takes the form of a light, soft, fine white flour. Tapioca flour adds chewiness to baking and is a good thickener. Tapioca flour is an excellent addition to any wheat free kitchen. It’s a fairly resilient flour, so storing at room temperature is no problem. Teff comes from the grass family, and is a tiny cereal grain native to northern Africa. It is ground into flour and used to prepare injera, which is a spongy, slightly sour flat bread. It is now finding a niche in the health food market because it is very nutritious (see today’s quiche recipe!). This flour is milled from polished white rice so it is very bland in taste, and not particularly nutritious. White rice flour is ideal for recipes that require a light texture. It can be used on its own for a variety of recipes and has a reasonable shelf life, as long as it is stored in an airtight container to avoid it absorbing moisture from the air.